Through a grant from the Pigeon River Fund administrated through the Community Foundation of Western North Carolina, Asheville GreenWorks has initiated a pilot program to keep litter from entering the French Broad River. 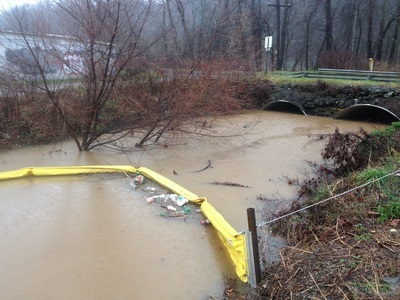 Installed summer 2015, this pilot is working to gather information about the amount of trash that enters our most urban streams through roadside and storm-water runoff. These booms are constructed as to allow aquatic and benthic creatures to pass freely without harm. GreenWorks staff, interns and volunteers monitor each of the booms on a weekly or rain event basis. For tracking purposes, the floating trash is weighed and sorted for recyclables. This information is then logged to support the pilot. Where is the trash coming from? 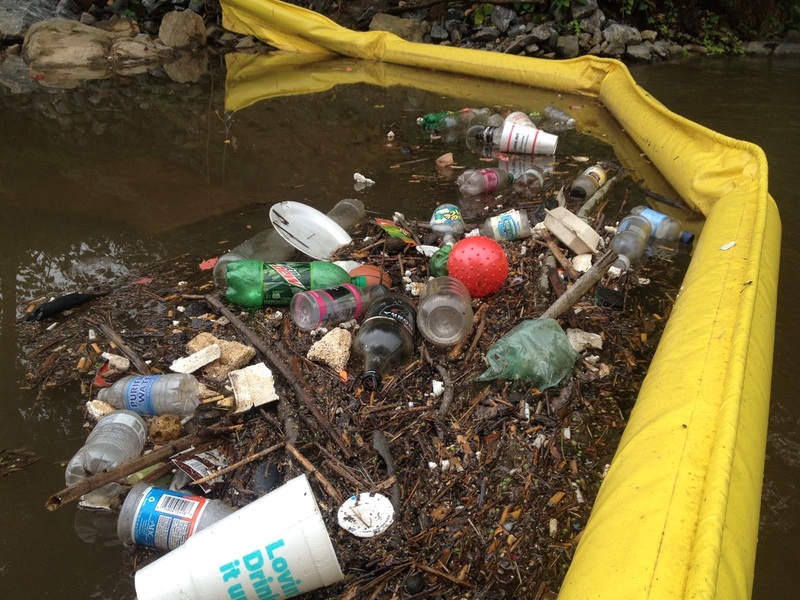 ​approximately 75% of the trash in the French Broad River basin. ​Once the trash has entered the water it begins an accelerated process of photodegradation. Whereby the petroleum based products (plastics / polystyrenes) begin to break into smaller and smaller pieces. These tiny pieces of trash are in some instances consumed by wildlife as they're mistaken for food. The majority of this debris goes on a journey that will take it through several states and rivers before finally ending up in the Gulf of Mexico. In 2014 volunteers removed 905 tires and 18 tons of trash from the local rivers. GreenWorks volunteers spend a great deal of time and energy removing this pollution from the river. The majority of the trash is single use plastic products and in most cases recyclable. 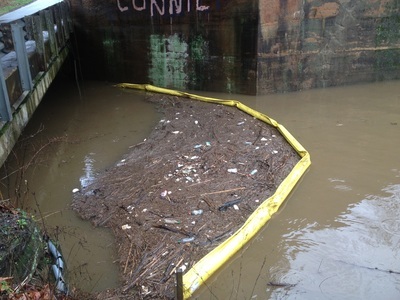 These booms effectively collect floating trash that is being funneled in through our stormwater drains, before it enters the French Broad River. 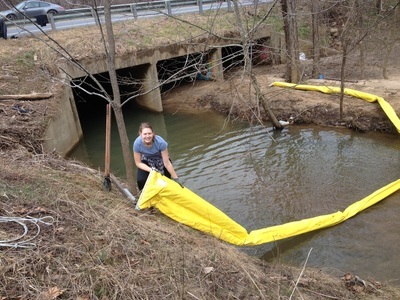 ​1) Keep litter from entering the French Broad River from it's tributaries. 2) Collect data from the trash accumulated to recommend modifications to our local storm-drain collection systems. 3) Increase awareness around roadside littering, our plastic lifestyle and waterborne pollution. Throughout the summer and fall, each of the trash booms were collecting an average of 15lbs of litter a week. *excess water and plant material are removed before final weights are taken. We find a great deal of cigarette butts behind the booms reminding us that there's enough toxins left over in 3 cigarette butts to kill an adult trout. 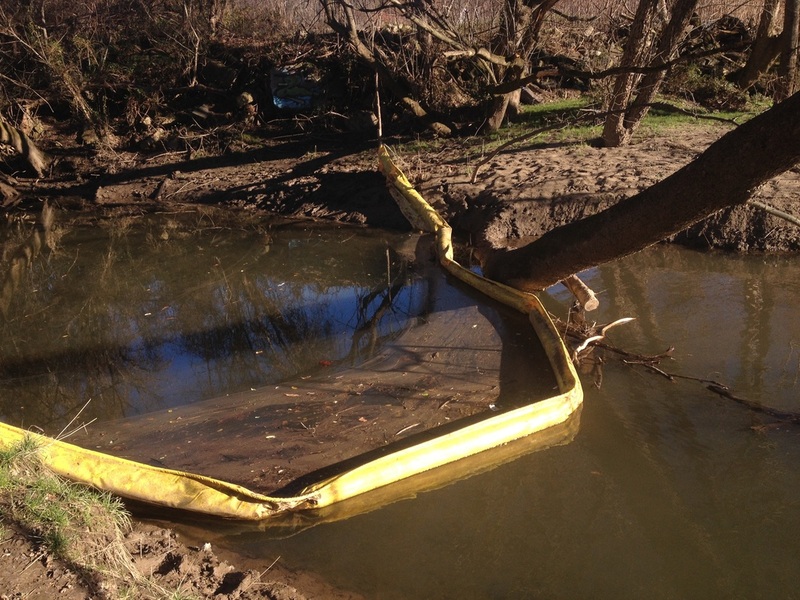 ​The booms are specially constructed to not interfere with aquatic life and allow water to flow freely underneath. At the present Asheville GreenWorks has four booms in the water with plans to install two more in 2016. Please help us monitor these booms for trash build up or damage. We're seeking volunteers to clean out and log the data from each collection point. If you're interested in helping out, please call 828-254-1776 or click HERE to email. ​Consider sponsoring a trash boom for one of our area creeks. Now taking sponsorships for the following tributaries: Sweeten Creek, Flat Creek, Reems Creek and Gashes Creek. Contact Eric Bradford for more information.